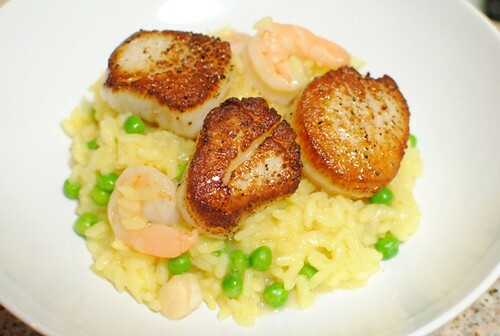 Risotto is one of my favorite dishes; there’s something very comforting about it. Creamy and rich, it’s shockingly simple with the most basic recipes only involving a few ingredients. I think it’s pretty easy to make an edible risotto, but making a great one is tough. Temperature too low? Then the rice ends up mushy. Temperature too high? Then the exterior of the rice cooks before the interior. The timing needs to be right too – the rice should be served al dente. Over the last week and a half, I’ve been playing around with making various risotto dishes, varying the ingredients (mushrooms, truffle oil, seafood) and heat control. I’ve experimented with two types of rice. Arborio seems to be the most popular from all the recipes I’ve been reading, but lately I’ve been using carnaroli. 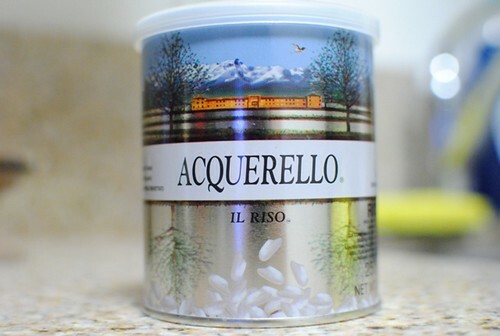 Not coincidentally, it’s the rice that Thomas Keller uses, and the rice used in the best risotto I’ve ever had (see: white truffle risotto at The French Laundry). The basics of a risotto sound simple enough: sweat onions in fat, add rice and coat in fat, add wine, periodically add stock until rice is cooked (stirring often), and finish with butter and/or cheese. 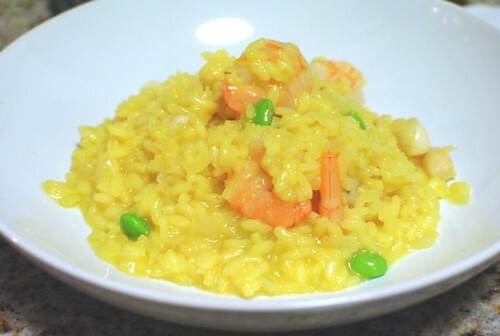 My latest one is a seafood risotto with saffron as the main spice. 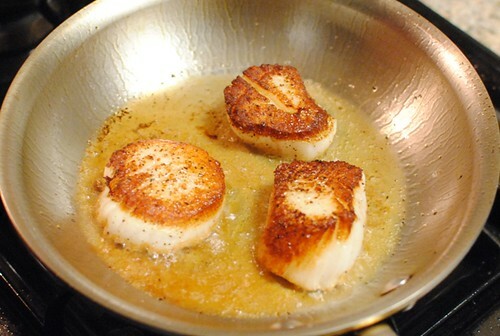 I stumbled upon some good looking sea scallops this weekend, so I decided to incorporate them too. The rest of the seafood was shrimp and bay scallops. Peas would add color and ensure I’m still eating my vegetables. I added the shrimp to the risotto a couple of minutes before the rice was finished and let it cook in the heat of the risotto. I added peas, bay scallops and butter off the heat, stirring to incorporate. The risotto was pretty good. I thought the flavors were on point and I was pretty proud of the sear I achieved on the scallops (keeping the interior translucent). They were cooked perfectly. The rice was al dente, but the risotto wasn’t as creamy as I wanted. 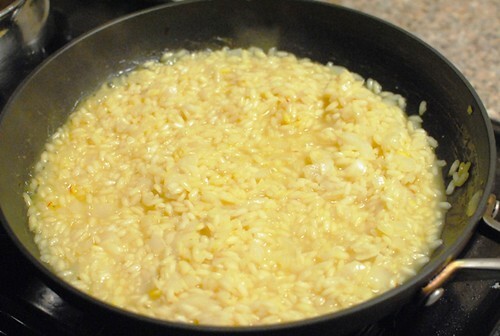 The risotto I made days earlier was creamier and richer (see below). I think I didn’t stir enough. Oh well, live and learn. Still, I was pretty happy with the dish; I’m amazed I haven’t overcooked any seafood yet. I hope to be experimenting with lobster and truffles sometime in the near future. Good job, D! 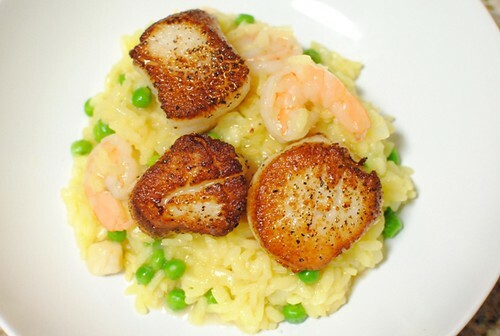 Your seafood risotto looks highly delectable.